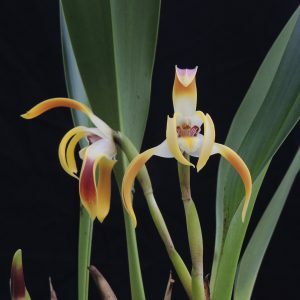 This wonderful species is our largest flowering Maxillaria species. Maxillaria triloris is native to South America and found from Venezuela to Ecuador as an epiphyte in wet forest from 800-1800m. We find that it enjoys the conditions of cool damp and shade in Cool Americas and we grow it in an open basket but with heavy watering all year. We do move it onto a shelf when in flower so that the flowers stay in pristine condition away from drips.